Týr is the son of Óðin, and he is the god of battle, of courage, and of the sword. Týr has one hand, and thus must fight left-handed. Swords were inscribed with the T- rune, symbolizing Týr and asking for his patronage. 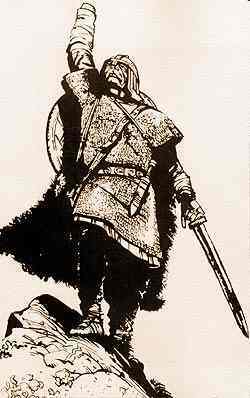 Few stories about Týr survive, although when he is named, he is described as one of the more important of the Æsir. 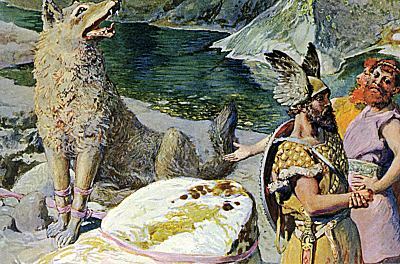 Týr's courage was indispensable to the gods when it came time to bind Fenrir, the wolf monster sired by Loki. 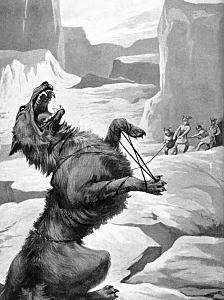 Twice, the gods had attempted and failed to bind Fenrir, who had increasingly become a menace to the gods. They asked the dwarves to make a fetter strong enough to bind Fenrir. The dwarves made a fetter smooth and supple as silk, called Gleipnir. Gleipnir was made from: the sound a cat makes when it moves; a woman's beard; the roots of a mountain; the sinews of a bear; the breath of a fish; and a bird's spittle. Fenrir refused to be bound for a third time unless one of the gods put his hand in Fenrir's mouth as a token of good faith that the gods would keep their promise to release the wolf if he could not break the bond. Only Týr was brave enough to do so. Fenrir was bound, and Gleipnir held. The wolf struggled, but only succeeded in making the bond tighter. Fenrir snarled and clamped his teeth. Týr's right hand was severed at the wrist. All the gods laughed, except Týr. The gods fastened the fetter to a chain, and the chain to a boulder, making a captive of Fenrir. The wolf continued to howl. To silence him, the gods thrust a sword into his mouth, hilt on the lower jaw and point on the palate. Blood and saliva flowed out, forming a great river. Thus silenced, Fenrir remains bound until Ragnarök, when his fetters will break, and he will swallow Óðin in a single bite.